The world God only knows : gamer ?? Keima Katsuragi, a second-year high school student, is an avid galge gamer. He is known on the Internet as "The Capturing God" for his legendary skills to be able to "capture" any 2D girl in games. However, in his actual school life, Keima is known as otamegane (オタメガネ), a derogatory portmanteau of the two words otaku (オタク) and megane (メガネ-"glasses") and is considered nothing but a gloomy geek with thick glasses. The world that runs of love! Well as you can see the summaries above...I'll cut the chase for my summary! Is a comedy,fantasy,drama, and a dating sim?! Katsuragi Keima a 2nd year at Majima HS who's known as Otamegane or the weirdest weirdo in school! but little they know that this Otamega is the God of Games and Dating Sims who's known as Otoshigami or Fallen God! One day he receive a help letter from Dokuro?! *Chief Of Hell* to help them capture certain girls! Of course as Keima thinking that GODS DON"T RUN AWAY! he accepted her challenge... upon the activation of the contract he was assign with a devil known as Elsea De Lute Irma! now he is now task to capture the hearts of real girls! Well overall this is a story of change! From a know it all God of Dating Sims to a Gigolo who can capture every girl given to him as a task! Katsuragi is a geek that plays video games on picking up girls all the time. When he receives a message of a challenge that he accepts, a demon named Elsie comes. Katsuragi is now attached to his challenge, and if he runs away from it, his head will be cut off by a collar that he cant take off. Katsuragi, or Divine One to Elsie, has to get loose souls out of girls by making them fall in love with him, which means, a kiss. This anime has kawaii characters, comedy, and drama in it and i would recommend it. I have to say for someone like myself who dislikes anything related to Harem....this series has really sucked me in with its story and interesting plot. Something about the whole idea of throwing in the PSP and having this nerdy boy try to capture "real" girls heart, was just hilarious and intriguing. From what I've seen so far, the series is definitely something you should try watching. The characters are like-able, and each mini story finds a gentle and romantic feeling towards the end, a sense of accomplishment and success, and after all the work the protagonist had to do you end up cheering him on!! I typically don't like harem's...but this one somehow finds a way to be just right for me. Maybe it will be great for you as well. BTW the opening song is just killer, Totally love it! Gotta give it a chance! Alright, so, right off the bat, the first episode was amazing! truly. It's so relatable and I'm sure a lot of you will like it if you just give it a chance. The characters are well made, the story is top notch ( sure it may seem like it may have the same story over and over. Main guy makes girl fall in love with him, capture soul, move on to next girl ) but it's really not like that. The girls have stories, there's some emotional dept deep within "The World God Only Knows". It's one of those shows you just can't miss, cause you'll pretty much wonder later on "why did I not watch this before?!" . Don't let that happen, give it a real chance. You'll laugh, maybe you'll drop a tear or two somewhere along, but pretty much you'll laugh more then you'll cry. Keima Katsuragi a second-year high school student is avid dating sim gamer.He is know on the internet as the "The Capturing God" for his legendary skills to be able to "Capture" any 2D girl in games.Watch the anime to find out more!!! Good God what a gamer! Well Keima Katsuragi, a second-year high school student, is an avid dating sim gamer. He is known on the Internet as "The Capturing God" for his legendary skills to be able to "capture" any 2D girl in games. However, in his actual school life, Keima is known as otamegane, a derogatory portmanteau of the two words otaku (オタク) and megane (メガネ-"glasses"). 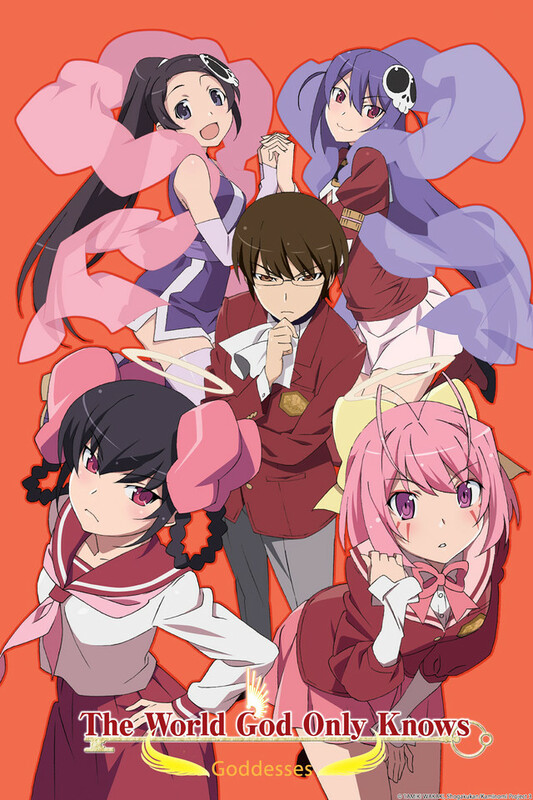 Kami Nomi zo Shiru Sekai—or better known as The World God only Knows—revolves around the life of an otaku, Keima Katsuragi, who would rather live in the life of games and anime than reality. In the online world, he is the "Capturing God" for he can snag any 2D girl. But from other peoples' points of views, Keima is nothing but a glasses-wearing, anime-loving geek. One day, he recieves this email challenging him at his position of a god, and, of course, he accepts; only later, a girl (Elsie) wearing Japanese styled clothing, a pink veil, and sporting a skull clip in her hair flies down to earth and tells him that he had just signed a contract with the devil—literally. His duty to the contract involves him having to collect "loose souls" from girls by winning over their hearts. This anime is an amazing rendition from previous animes and involves base and unoriginal storylines, but adds new twists to make TWGOK all its own. Keima makes girls swoon (in real life AND in the anime), making us all wish that avid game players really were this charming! Although the plot and some of the characters (for example, Elsie) are predictable from other storylines, this series is one to watch all the way through. Enjoy! Keima Is The World God Only Knows!! !